Gaining self confidence will help you achieve success faster. This article by Carmindy inspired me on how to beat low self-esteem on my morning commute to the “big city”. I thought it was great and I wanted to share with you how self-coaching can really change your life. Who is Carmindy and Why She Matters! She’s a makeup artist to the celebrities and on a TV show called “What Not to Wear”. 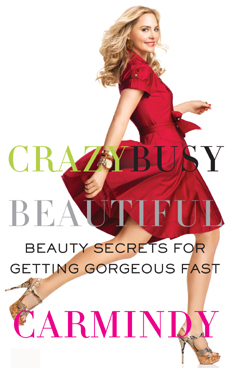 She’s out promoting her third book called Crazy Busy Beautiful which definitely sounds like something I should read. My goal in my working life is to look as polish and proper as possible in as a little of time. As I’ve stated before, people do judge you on your looks. Working in “Corporate Canada” it’s important for me to dress-up and look my best if I want to move up. However, I already get up at some insane hour to squeeze in my workout so it’s all about utilizing my time to the fullest. Carmindy is a gorgeous and successful blond that doesn’t look like she has an issues attracting whatever she wants in her life. I was shocked to learn that growing up she says she was less attracted and felt she wasn’t pretty. I guess everyone has an “awkward” time. I know I did! I’m going to take Carmindy’s quote right out of the interview she had with Janine Falcon from Metro Canada on how she dealt with feeling unpretty. I think we really underestimate the power of self-coaching. I think a lot of us spend too much time focusing on our imperfections and not enough time appreciating what we have. It’s always great to look for ways to improve in our live but when it comes to our looks we should be less harsh. Being appreciative of our strengths and less focus on our weakness will lead to gaining self confidence. Growing up I hate my body- I never thought I was thin enough. I wanted blond hair and blue eyes- not the dark features I was born with. I was constantly comparing myself to my friends that were naturally thin. I went through part of high school with bleached blond hair (gross now that I’m looking back at those pictures). Of course, I had friends that were heavier than me and you know what they had really high confidence. You know why? Because they embraced what they did have like great skin, gorgeous eyes and thick hair. They dress very flattering to their body types too. Focusing on what you love about yourself will make you more attractive to others. Gaining self confidence starts within. We can learn a lot for Carmindy about her positive affirmations and relate it to all aspects of my life. Whatever I want to achieve in life I will start saying and believing it out loud. Click here for more tips on gaining self confidence.